WD5FUN (Doc's) Wife Sandy is in the hospital in serious condition. Please go to the Chapel and Light a candle for her. Our Brother KB3YBS (John Lifetime Member 450) became a Silent Key Saturday April 6th. Please go to the Chapel and light a candle for John. WILL BE HELD ON: MAY 30, 31, & JUNE 1st. ​CLICK THE BUTTON BELOW FOR ALL THE INFO. Click on the button to access the logger. You are not limited to the Night Watch or Brothers Net Logos. You can have anything you like on the back and or front. ​The prices are the same. One evening in 2009 WA9KFB Phil was cruising around the band when he came upon a QSO. While listening to the QSO he heard one of the guys mention he was originally from Wisconsin. After the QSO ended, WA9KFB Phil struck up a QSO with NØDNR Larry. During their converstation each discovered they had brothers still living in Wisconsin, and each of the brothers now had their fathers call sign. WOW how wild was that? WA9KFB's brother WA9KMB Kurt lives in Medford, WI and NØDNR's brother K9TRM Ted lives in Baraboo, WI. Well the freindship was formed. After the four of them had several QSO's. Kurt WA9KMB made the suggestion that they start a net. The Brothers Net first born on February 14, 2009. With a whopping check in of 5 Hams. Becoming a Lifetime Member is easy & FREE. Just check into The Brothers Net 10 times. On your tenth check in you will be assigned your Lifetime number. 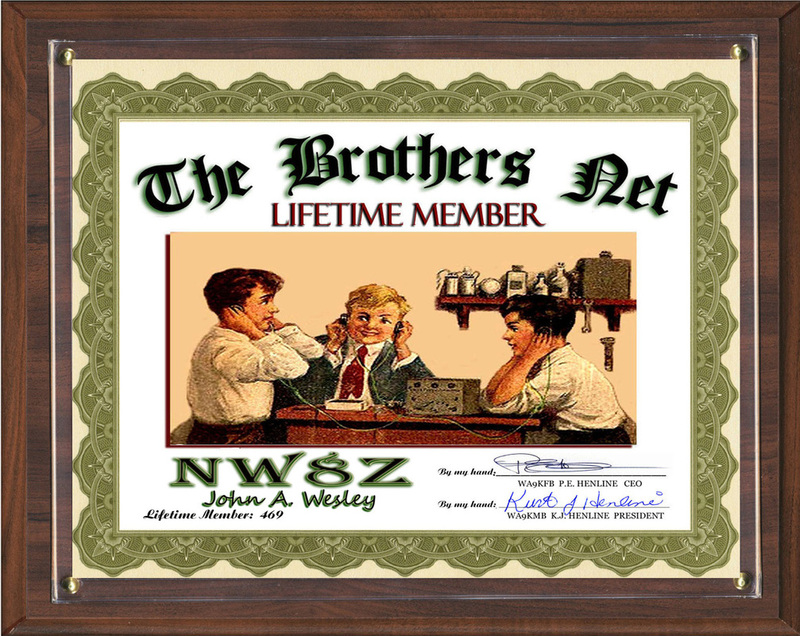 If you would like a Lifetime Membership Certificate. There is no charge for your Lifetime Certificate . For the music lovers. We have added a great site with music and video. If you are sending pictures. Please include your Call Sign..
We can not track you without it.